are almost here! 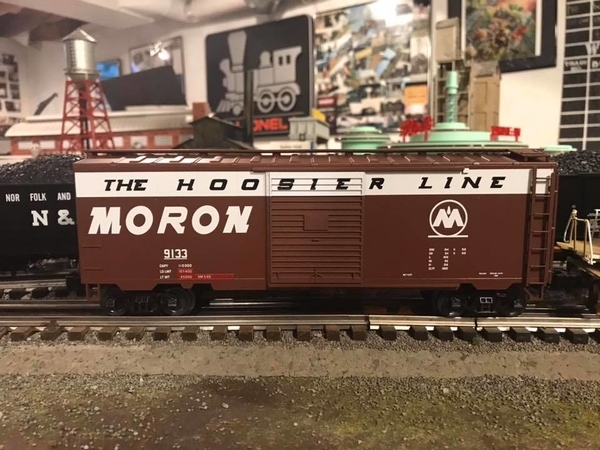 The production sample of the XP Trains Moron boxcar arrived from Lionel today. These will go into production very shortly and are expected to ship just after April York. We still have some available, but not many.. Also, our order quantity is set in stone with Lionel so once they're gone, they're gone. Check out www.madisonposter.com to place your order. It's FREE O Gauge Radio. 24 Hours a Day, 7 Days a Week, 365 Days a Year. The behind the scenes of one of America's most famous hobby shops. Click Here for more information. The book is sold out as of December 29, 2017. I like it! Wish we could pick them up at York. That was the original plan. However, between my accident limiting my ability to walk long distances and the fact that I’ll be wrapping up two weeks of schooling for my auctioneers license just made it impossible this time around. Maybe for the next release. Hope to see many of you this Fall. …… However, between my accident limiting my ability to walk long distances …..
Long story short, back in early December I tried to fly off a ladder in my new shop and took a 13 foot fall and landed on the concrete. Dislocated left shoulder, shattered left elbow, fractured right and left hip, and broken rib. I was VERY lucky. Earned myself some new titanium hardware in my elbow and hip. While I am back to 90% of my day to day activities, the walking and hours that York requires of me is still out of the question. I'm exhausted when I'm healthy! Should be ready to get back at it in October. SO WHAT'S NEXT?? SANTA FAYE?? LOL, should'a said "The Headache Line" too!!!!!!!!!!!!!!!!!!!!!!!!!!!!!!!!! May not be too late!! Wow.. lousy luck! !, but good if you get "restored". Monon with BL-2's was an interesting RR. Were any ATSF cars "hacked" as "Santa, or Sandy Faye"? Derek, thanks for the update, and hope the healing continues. Looking forward to the car and hope to see you in October at York.